"Our goal since the Hebron project was announced in 2008 was to safely achieve first oil in 2017; today we delivered on our commitment," says Carman Mullins, president of ExxonMobil Canada. "Hebron is an engineering and construction marvel, and thousands of Newfoundlanders and Labradorians can proudly say they helped design and build the platform." The project achieved more than 40 million hours during construction without a lost-time injury. Since the project was sanctioned in December 2012, Hebron has been a significant contributor to the economy of Newfoundland and Labrador. It has provided direct employment and training to thousands of NL residents, including more than 7,500 personnel during peak construction. Hundreds of contractors and subcontractors throughout the province supplied materials and services to the project. The completed platform was towed to the field in early June 2017, following its construction at Bull Arm, NL. The platform was then safely set down, and drilling commenced within 30 days. 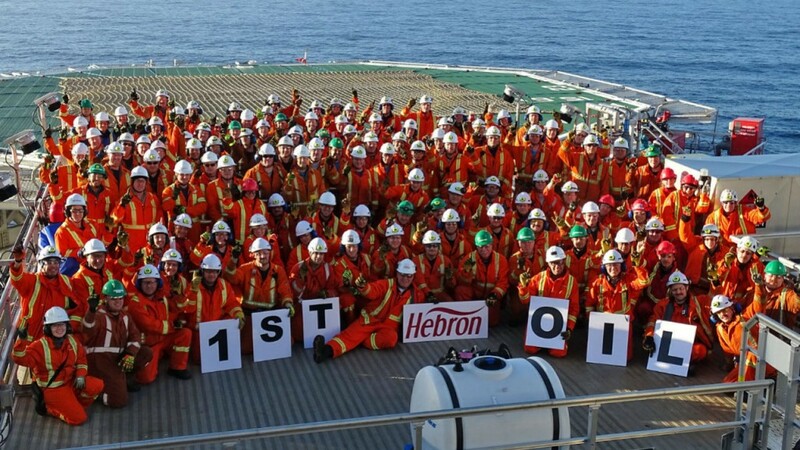 Drilling and production operations mark the start of the next phase of the Hebron journey. The project is expected to provide long-term employment for over 600 personnel and support long-term economic development opportunities for various local supply and service companies for many years to come. The project is also expected to generate millions in annual royalties and taxes for the province during the production phase. It is estimated that the field, first discovered in 1980, will produce more than 700 million barrels of recoverable resources. At peak rates, the Hebron platform will be able to produce up to 150,000 barrels of oil per day, and has storage capacity of 1.2 million barrels of oil.